So you’ve been looking forward to your ‘all-girls-trip’ to Goa or you looked at your calendar and realized that your cousins wedding in Udaipur is this weekend! How many times have your products broken or crumbled or the contents have fallen everywhere the moment you open your bag? 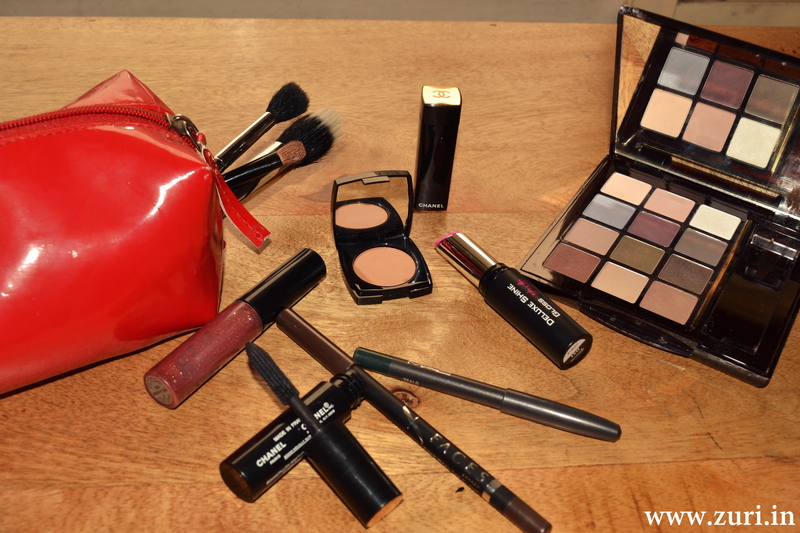 I know just how might be tempting it is to use a beautiful makeup bag, but believe me, you are better off using something that’s washable or at least something that you won’t mind getting a bit dirty. The first thing to do before diving into the packing process is to think about your makeup the same way you think about the clothes you’ll be packing. What are the products you really need and are going to use? Each liquid you carry must be in its own container of no more than 100 ml (including lotions & creams). All liquids should be carried in a single, transparent, re-sealable plastic bag of up to 20 cm x 20 cm (8 in x 8 in) with a total capacity of up to a litre (approximately one quart). 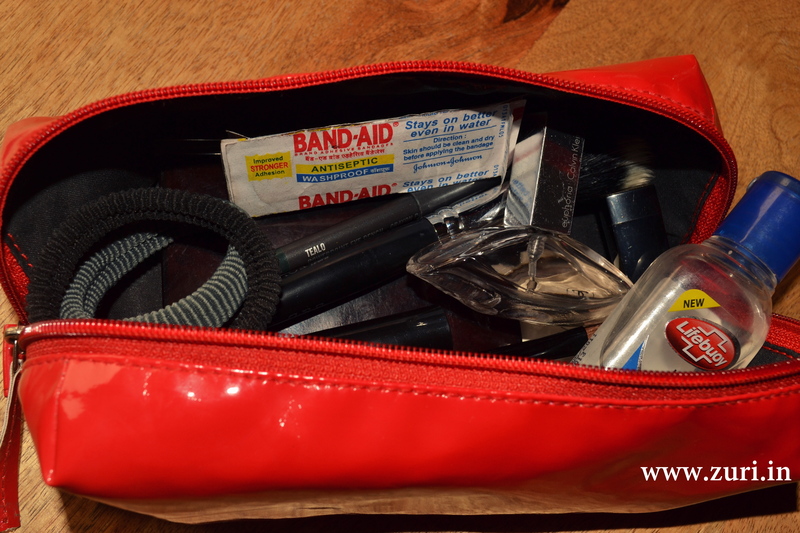 Keep a separate pouch for your daily items like toothpaste, tooth brush, shampoo, conditioner, body lotions etc and a separate one for your makeup stuff. 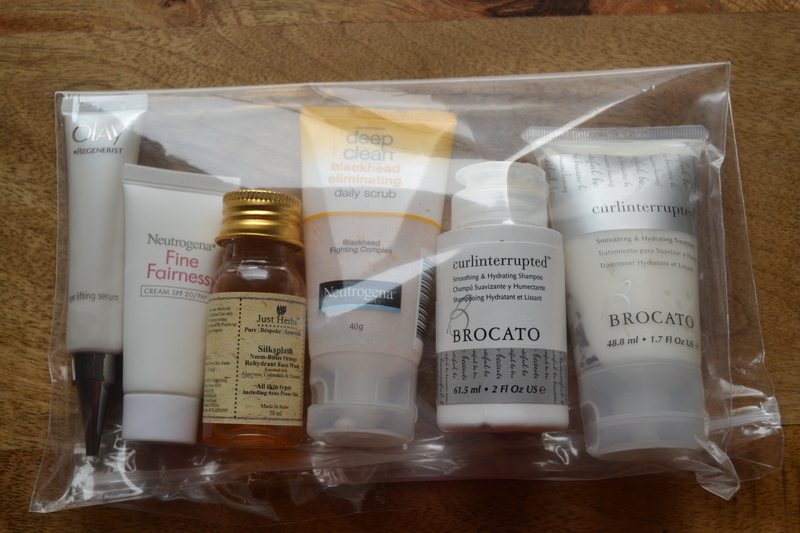 I don’t like to play around too much with my skin care when I travel as I find sometimes my skin behaves strangely. Organize makeup brushes in a pencil box or a lengthy pouch. My favorite way to organize beauty products is by placing them in Ziploc bags – in case if something leaks or shatters, the actual bag is saved from being ruined. To prevent powder products like eye shadow, blush and powder from cracking, insert a thin layer of cotton inside. This way, if your bag gets knocked around in the conveyor belt, there’s an extra layer to absorb the shock. Majority of the beauty companies like Clarins, Lancome etc. are very lavish in giving out testers. I have a separate pouch in which I store all the cream and lotion samples for when I need to travel. They hardly weigh anything and save on so much space! When I buy a fragrance I always ask if they have samples, as I keep those mini trial ones in my makeup bag. There’s nothing sadder than giving up half full bottle of Calvin Klein perfume to the airport employees. When I travel, I make sure to bring back the shampoo, conditioner & lotion bottles from hotels so that I can refill them with my everyday products when I need to travel next. Since the containers are transparent, you can easily see what is placed in it and there isn’t a chance for them to leak. Products that have more than one use are great to carry on trips. Cream blushes that work as eye shadow and lipstick, kajal pencil that can be used as an eyeliner & fill in eyebrows, Vaseline for dry skin & lips etc. Now that everything is packed, run through the products once again and prioritize. 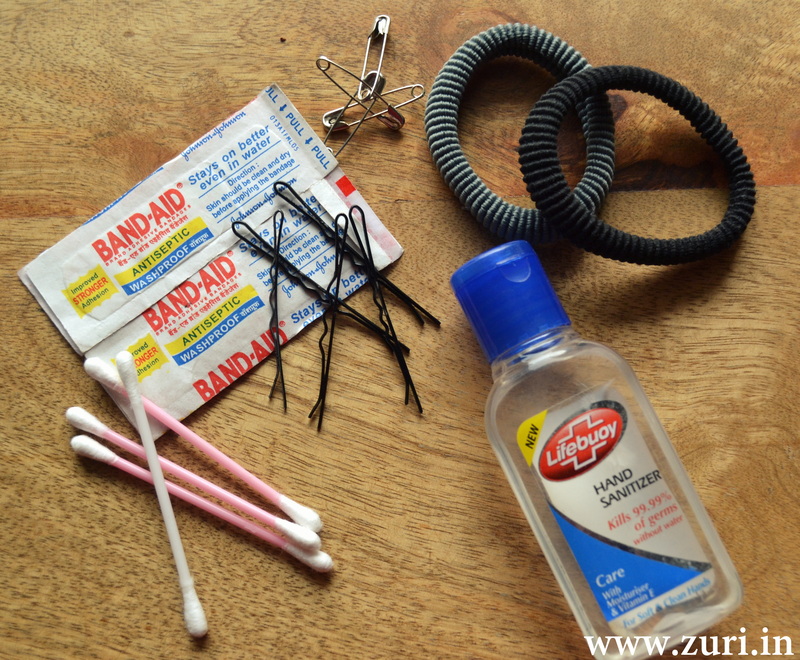 Next add products that you most probably will need – band-aids, Q-tips/ear buds, some safety pins and bobby pins, a hand sanitizer, scrunchies, and a travel sized pack of makeup wipes.